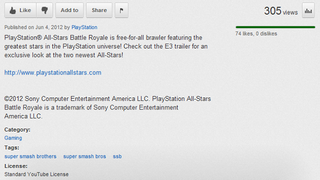 Why Does PlayStation All-Stars Battle Royale's YouTube Page Have A Tag For Super Smash Bros.? Some might say that Sony's upcoming brawl game, PlayStation All-Stars Battle Royale, is something of a Super Smash Bros. clone. Maybe Sony agrees.